What are plasmids, and why are they so useful? Cloning sites A cloning site is not required at all, but it sure is nice to have! What I mean by "cloning site" is a place where the DNA can be digested by specific restriction enzymes - a point of entry or analysis for genetic engineering work. This is a matter we will be discussing in great detail at a later point. For now, think of the following example: Suppose you are really thirsty and you buy a can of beer. Does it occur to you that one end of the can (the "top") is designed so that you can open it easily? If you bought a can of beer with two bottom ends and no top, you would have a hard time drinking it! It's the same way with plasmids. You can have a plasmid with lots of terrific features, but you might lack an easy way of "getting it open" with restriction enzymes. All this talk is making me thirsty, and now I believe I'll have that drink! Origins of replication: Since a plasmid is (by definition) an extrachromosomal element, it cannot make use of any origin of DNA replication in a chromosome. That is, DNA synthesis within (i.e. copying of) a plasmid depends on its having an origin of DNA synthesis of its own. Obviously, if a plasmid couldn't be copied, it would be rapidly diluted out in a population of dividing cells because it couldn't be passed on to daughter cells. Selectable markers A selectable marker is not actually a required element of a plasmid, but it makes it possible for us to maintain stocks of cells that contain the plasmid uniformly. Sometimes, carrying a plasmid puts a cell at a selective disadvantage compared to its plasmid-free neighbors, so the cells with plasmids grow more slowly. Cells that happen to "kick out" their plasmid during division may be "rewarded" by having a higher rate of growth, and so these plasmid-free (sometimes referred to as "cured") cells may take over a population. If a plasmid contains a gene that the cell needs to survive (for example, a gene encoding an enzyme that destroys an antibiotic), then cells that happen to kick out a plasmid are "punished" (by subsequent death) rather than "rewarded" (as in the previous scenario). That selective pressure helps to maintain a plasmid in a population. The lesson of the petri plate. Once upon a time, a plasmid met a cell, and they struck up a conversation. Saith the plasmid, "Kind cell, I bring thee a gene for antibiotic resistance, and if you let me in, I shall repay you by showing you how to make an enzyme that might save your life one day." The cell replied with annoyance, "What use hath I for the likes of thee? My food is all gone, I'm freezing my pili off, and you think my biggest problem is antibiotics? Maybe you're just a selfish gene, looking for a cell to make copies of you. Begone!" The plasmid smoothed out his supercoils, dodged a DNase, and tried to think of a suitable reply. Just then, a massive wave of thermal energy struck them both, and it was all he could do to not lose his footing, standing as he was on the cell membrane. The plasmid trembled, partly to distribute the energy uniformly to his vibrotational degrees of freedom, but mostly at the thought of how painful thermal denaturation might be. Fortunately, it was not coming to that. Not this time. The temperature was high enough to pop a few hydrogen bonds, and his strands were breathing a bit, but he was covalently closed after all. He could handle it! The cell was not so lucky, however. His membrane, which had been reasonably firm to this point, began to swirl and form vortices, and lost its smooth surface. The cell had gotten used to the cold temperatures by boosting the fraction of short chain and unsaturated fatty acids in his membrane. While it gave the membrane a good consistency in the icy cold, it was completely wrong for this new, higher temperature. The van der Waals interactions weren't strong enough to maintain cohesion, and errant lipids were now leaping through the bilayer like divers at a mosh pit. Huge patches of the membrane were involuting, bringing massive gulps of medium inside. The cell was just seconds away from a complete membrane breach! Then, as quickly as it had started, the problem was over. The buzz of thermal energy was drawn away by some unseen entropic sink, and dissipated. The membrane returned to its glassy-smooth state. The plasmid was now inside the cell, having been carried through the membrane in its moment of weakness, but the cell was too preoccupied to notice the uninvited guest. The cell was using his last remaining energy to bail out the excess liquid, and set his ion gradients to rights. When he thought he could do no more, that his determined course would be senescence and death, a warm flow of fresh medium restored his spirits. "Ah! Tryptone, and yeast extract", he said as he gratefully derepressed half a dozen operons. His ribosomes got right to work, making the enzymes that would help to catabolize the new food source and restore the structure of the cell to full health. He almost exclaimed, "I thought Darwin had me for sure that time!" but being a cell with little memory he had already forgotten the privations of a few minutes earlier. Thirty minutes passed, and he found himself cast onto a wide surface that was warm and rich in nutrients. "Not bad", he said. I could live like this for generations!" But then, the horrible sounds of dying cells reached him. All around him, his brethren were being killed by an unseen attacker. An antibiotic was there, and was destroying the entire population. Oh the humanity! He braced himself for death, but then ... nothing happened. He was alive! "Remember me? ", said the plasmid? "I told you that I might save your life one day, and now it has come to pass." The plasmid, which had gone unnoticed since the thermal catastrophe, had been copied several times and transcribed by the cellular machinery. It had provided a gene that encoded an enzyme that destroyed the antibiotic before it even got into the cell. Although more antibiotic was diffusing into the neighborhood, the enzyme was on the job, and prevented it from doing any damage. "Yes, you were right", said the cell. "I am grateful that you transformed me, and now that I have a logical explanation for my good health, I don't have to develop survivor guilt either. Stick with me, plasmid, and I'll make sure you are provided with a high copy number." The generations passed, and the cell divided many times. Each time there was fission, the two daughter cells received an inheritance of plasmid copies. There was widespread prosperity. I would say "They lived happily ever after", but sadly that is not the end of the story. The daughter cells grew into a prodigious colony, and soon had destroyed so much of the antibiotic in the immediate vicinity that the real danger had passed. Some cells that had not perished in the original attack even managed to survive and grow nearby - little "satellite colonies" seeking refuge from the high levels of antibiotic elsewhere. Then the cells in the big colony became lazy. The plasmid was not replicated to the same high copy number - it no longer served the interests of the cell to do so. Sometimes, daughter cells did not inherit even a single copy of the plasmid! As the colony aged and grew, the proportion of cells that carried the plasmid became less and less. The colony actually believed itself to be quite progressive on this point. Some of the more strident cells even argued: "Why should young cells be forced to make enzymes that they don't need?" They said "We want to evolve higher order characteristics, not merely regurgitate the knowledge that served our great-great-great grandcell!" Before long it was unfashionable to carry the plasmid, though a few still did, but the colony grew faster without the added responsibility of the added synthesis. One day, a toothpick scraped the colony from a plate and carried it high into the sky. "At last," the progressive cells thought, "we are entering a bold new era in which we are going to be able to realize our true genetic potential!" The toothpick was dropped into a tube of fresh medium. The fresh medium had fresh antibiotic. What happened next is almost too horrible to tell. The cells that still carried the plasmid lived of course. They produced the enzyme that destroyed the antibiotic. The cells that had not inherited the plasmid were unworried at first, because they thought that a protective shield of enzyme could be built by the others, but being in liquid medium there was no hope for them. The antibiotic was not limited by diffusion, as it had been on the plate, and they were soon overcome. The few wise cells that had not lost their plasmid went on to eternal storage in glycerol stocks, and were written about in books and famous journals. They were grown in huge 10,000 liter fermentation tanks, and provided with the very richest medium that had ever been made! Bacteria can sometimes take up DNA from the external environment, a natural process that we call "transformation", and sometimes the DNA taken up is a plasmid that can be maintained in the cell because it has an origin of replication. Plasmids often earn their keep by providing a gene that gives a selective advantage to the cell, which then replicates (instead of dying) and makes more copies of the plasmid. What happens if the plasmid is taken up by a cell that cannot make sense of its origin of replication? After all, origins of replication are not universal, and one species may not recognize a sequence that works perfectly well in another. Well, then the DNA has only one way of being maintained, and that is to become integrated into the host chromosome. Integration isn't likely, but it can happen. What happens if the plasmid provides no selective advantage to the cell. Can it be maintained? Yes, but practically speaking it would be hard to pick out the cells that carry it because they would be surrounded by perfectly healthy cells that did not carry it. If you were to do a transformation in the laboratory, and put the cells on a bacteriological plate that lacked antibiotic, the plate would be covered with a solid lawn of bacteria the next day. Why? Because very few cells take up DNA in a typical transformation experiment, and most cells are usually killed by the antibiotic. It is the rare cell that survives. On the other hand, some cells do become "freeloaders" and survive because other cells are doing the work of destroying the antibiotic in their immediate vicinity on the plate. 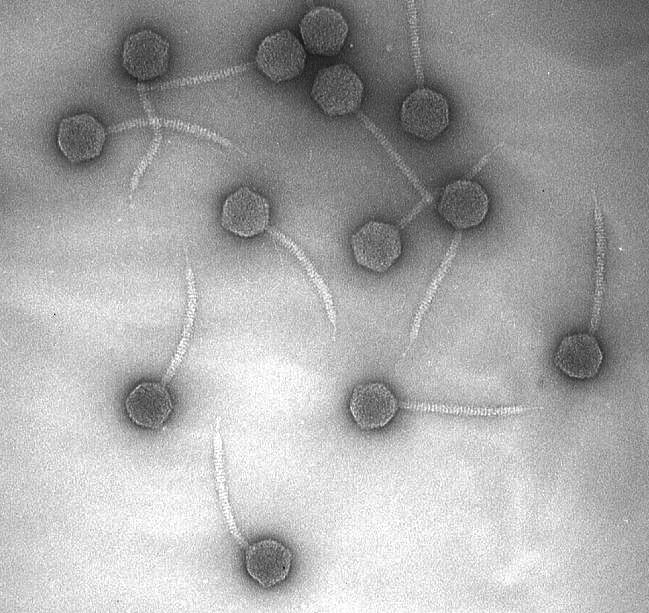 We call these "satellite colonies" because they are tiny little colony specks that surround the big antibiotic-resistant colony. They only develop with antibiotics such as ampicillin, that are destroyed by enzymes such as beta lactamase outside of the cell. See the little satellites around the big colony? Are satellites a problem? Probably not, provided that the colony is subsequently picked and grown in fresh medium containing antibiotics. If the ampicillin plate is old (meaning that the antibiotic is partially degraded), or the transformed cells are plated at very high density (meaning that the plate is covered with resistant cells), or the copy number of the plasmid in the cells is so high that beta lactamase is secreted at high levels, or the colonies grow on the plate for several days (allowing more time for degradation), then satellites are more likely to develop. Other types of mischief can also develop. Half of the cells in the middle of an ampicillin resistant colony may become lazy themselves, kicking out the plasmid and living off of the work of the other cells. It's like being the kind of person who goes to the bar to enjoy the music, but never puts a quarter in the jukebox to share the cost. If you pick a bacterial colony and streak it out on a fresh plate with antibiotics, the loafers are exposed and they get their just desserts. Bacteriologists love to streak out cells, because getting a single colony on a fresh plate makes them feel like they are starting an experiment with something "known". They've separated a potential mixture into individual cells, and the cells have each grown up into a colony. They are hoping that the cells in a single colony will be identical, and that there is no mischief afoot. Still, plasmids make plenty of mischief in the world. They are one way that you can get natural and efficient horizontal transfer of information between species. For example, Vancomycin was an antibiotic of last resort against Staphylococcus aureus infections. Resistance to vancomycin is associated with the VanA gene, which is carried on a plasmid in other species of bacteria (such as Enterococcus faecium strain BM4147). The bad news is that Staphylococcus has been learning how to survive in a hospital, by taking up DNA from other species that have overcome the commonly used antibiotics - recently it was reported that there exists a StaphA strain Mu50 that is showing signs of vancomycin resistance! Transformation of a plasmid from Enterococcus to Staphylococcus is the probable cause. What is the process of cloning a plasmid? When we say that something is "cloned" we mean that it grew from a single genetic origin. In the case of a plasmid, we mean that the DNA has been separated and grown on its own. If we were to take a fresh colony of bacteria containing the plasmid, then it is probable that all of the bacteria grew from a single cell, and that the plasmid they contain was derived from a single molecule that happened to drop into the cell during transformation. The idea of a "clone" is important, because it is a point of consistency in an experiment. You have the opportunity to obtain a raw material that is pure, not a mixture of many things. Once you've done an experiment, you can repeat it again and again, because you still have the original clone. It doesn't matter how you made the clone, whether you dropped the agarose gel onto the floor when you were isolating the fragment, whether you accidently threw it in the garbage and had to go diving into a dumpster to recover it. Nobody really knows and nobody cares. Once you've transformed the DNA into the cell and isolated a colony that is pure, all else is forgiven. In the past 20 years, molecular biology has moved faster than any other field of science, and it is the ability to fiddle with the inner workings of genetic material reliably that made it so. Biochemistry and molecular biology are not the same thing. The Salvation of Doug; a tale of two retired scientists and some rope. Why did the geneticist tie the arms of individual workers at the factory? Because then the workers would not be able to do their jobs. Because it would teach Doug and the geneticist what it is that the worker does. What is the difference between selection and screening? We introduce the reclosed (ligated) products into E. coli, a process called transformation, and select for bacteria resistant to a drug (such as amipicillin, for example). The term selection is usually taken to mean that there is death involved for the cells that are unwanted. If the E. coli have taken up and expressed an ampicillin resistance gene on a plasmid, they will live - otherwise they will die. This process is called selection, because we are selecting which bacteria may survive. Transformation is a rare event, so most bacteria in an experiment are killed by the antibiotic. If a bacterium takes up a piece of DNA that cannot be maintained in a cell (e.g. if it lacks an origin of DNA replication) that cell also will not survive. It's a tough world! We screen individual bacterial colonies to find one that contains a plasmid of the correct structure, and we do this by some process of looking at the DNA sequence. At this stage we have a bacteriological plate (agar medium containing ampicillin) with bacterial colonies on it. Each colony contains a different plasmid type, because each was grown up from a single transformed cell. What we do now is to isolate DNA from each colony (or a small growth of cells propagated from the colony), and analyze the structure of the plasmid with restriction enzymes or by DNA sequencing. We can use gel electrophoresis to identify the sizes of restriction fragments that are released from the plasmid and to check the purity of the preparation. It's like an audition for the casting of a movie, where the director wants to do a screen test. We would think of all the actors as candidates, but perhaps only one has what the director is looking for. In a cloning experiment, the colonies do have a plasmid carrying the drug resistance marker so they might also be considered "candidates", but once we isolate them and realize that they are the wrong thing, then we don't work with them any further. Are these different? Yes, because in one case the arrow points from the "Amp" to the "ori" and in the other it points the other way. The arrow in the diagram shows the direction of transcription/translation of the "red gene" coding sequence, and the two orientations differ with respect to the outside markers for the ampicillin resistance gene and origin of replication. Perhaps we don't care which orientation we obtain as our final product, but we should note that there is a fundamental difference between the two. Efficiency of transformation in the lab. When we are transforming DNA in the laboratory (i.e. for experimental purposes), we have several ways of making the uptake of DNA by E. coli cells more efficient. One method is to starve the cells in ice-cold calcium chloride solution, add a sample of ligated DNA, and "heat-shock" the cells at 42 degrees C for a short period of time - about 45 seconds. The fluidity of the membrane increases to the point where DNA is taken up by the cell. A second method is to deliver an electric shock to the cell, releasing a charged capacitor with a field strength in the sample of approximately 1200 volts per millimeter. The DNA is swept into the cells as the membranes are temporarily breached. This process is called electroporation. Plasmids are sometimes called "vectors", because they can take DNA from one organism to the next. Not all vectors are plasmids, however. We commonly use engineered viruses, for example bacteriophage lambda, which can carry large pieces of foreign DNA. Why do we use the word "vector," which we've been trying to forget ever since we took Physics 100? The word has a connotation of taking something from one place to another. A mosquito is said to be a "vector" for West Nile Virus or malarial parasites, and in a similar way a velocity "vector" in physics indicates a direction in which an object is travelling. In molecular biology, a "vector" is a piece of DNA that may be introduced into a cell, usually after we've played around with it a bit in a test tube. What do these plasmids really have in them? Let's look at a few maps. But what do the plasmids really look like? You've probably also noticed how knotted up a telephone cord can get, if your roommate twists the handset around a few times before hanging up. Those knots are a higher order structure that lead to "coiled coils." DNA has the same problem, though your roommate isn't to blame this time! Aside from the double-helical structure that we all know and love, DNA can take on a higher order coiling that twists one double helix around another. We call this "superhelical coiling" or simply "supercoiling." In a linear molecule these twists can unravel by themselves, provided the ends are not prevented from rotating. In a circular molecule with no free ends, the superhelical twists are "locked in" and the molecule cannot relax. This coiling is not the same as the right-handed double helix coil with which you are all familiar. The supercoiled molecule is a coiled coil. It's like when you wind up a rubber band powered airplane. You start with a rubber band that is relaxed. Of course, the band is under tension and if you let go of the propeller it will spin around and relieve the tension. The supercoiled DNA can do the same thing (although not so far as to make the double helix uncoil). 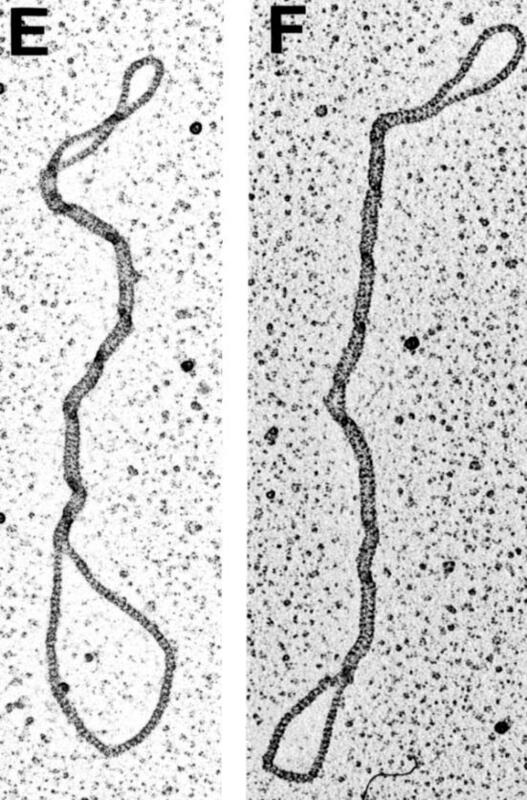 The image below showns an electron micrograph of a supercoiled DNA. Click on the picture of the supercoiled DNA, and trace the contour of the molecule. Is it a circle? What's needed to get supercoiled circular DNA to relax? A few weeks of mud baths and pampering at a spa perhaps? No! If one of the two strands is broken so that it has free 5' and 3' ends, the supercoils can relax even though the overall structure of the molecule remains a circle. The free ends of the broken strand rotate around the phosphate backbone of the intact strand (the one that wasn't broken). This loss of superhelical stress puts the plasmid into a "relaxed DNA" form. We often distinguish between different structures of DNA by gel electrophoresis. Do you remember our discussion about the phosphate backbone of nucleic acids? The backbone is made up of phosphate ester linkages that are negatively charged. If we place a DNA molecule in an electric field, it will therefore be attracted to the "positive" electrode (the red one), and this is what we call "electrophoresis." What happens if we partially block the path of migration of the nucleic acids, by placing the DNA in a gel of polymerized agarose or acrylamide? Then the rates of migration are reduced, because the molecules must traverse a complicated obstacle course. The crosslinked matrix of the gel will tend to reduce the rate of migration of molecules with a larger cross-section. An analogy: for those students who might rather be out fishing. Imagine ... you are casting a net into the ocean. The boat is going back and forth, back and forth, back and forth, back and forth. I'm getting sick just thinking about it. Anyway, you've chosen a net with a mesh size that will capture large fish and allow the smaller ones to swim through. What happens to the medium size fish? They can make it through the net, but their rate of progress is slower. Which fish will make it through the net most easily? Obviously, the spotted eagle ray is going to have a bit of trouble! On the other hand, the eel may glide through the net more easily as long as its orientation is favorable. We can imagine therefore, how the size and shape of the fish might affect our catch. DNA is just like the fish in our example. Larger molecules will be tend to be more delayed in electrophoresis than smaller molecules, because they keep bumping into obstructions. Molecules that are branched (for example, DNA molecules that have a single-stranded "bulge" in the midst of double-stranded DNA) will migrate more slowly than molecules that are perfect homoduplexes. Which molecule wins the electrophoresis race? 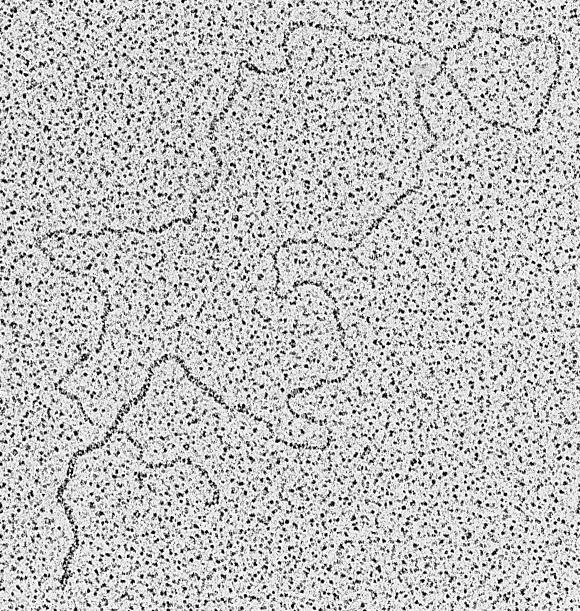 Molecules that are more compact because of supercoiling will also encounter fewer obstructions, and will migrate more rapidly through a gel matrix. The Fugu genome project: The FUGU Project is a comparative mapping project funded by the MRC to allow Sydney Brenner and Greg Elgar, through the HGMP, to generate a landmark map of the puffer fish, Fugu rubripes (Fugu) genome. The Fugu fish has essentially the same number of genes as the human genome, although its genome size is only approx. 400 Mb. Now, the draft sequence of Fugu is publicly available. I wanna eat Fugu, but I don't wanna die! Progressive digestion of a supercoiled DNA molecule. When a supercoiled plasmid is digested with a restriction enzyme, the molecule relaxes after the first nick in the phosphodiester backbone (we say it is "nicked" because it isn't cut very deep with only one phosphodiester bond broken). This relaxed circular molecule migrates more slowly that the supercoiled molecules during gel electrophoresis, because it cannot fit through the gel matrix as easily. Once the enzyme has had a bit more time to do its work, linear molecules will be formed (after the phosphodiester backbones of both strands have been severed). The linear molecules migrate more rapidly than nicked circles, but less rapidly than supercoiled circles. This is a bit of a simplification, because the movement of the supercoiled DNA is a bit different if the gel has been cast with ethidium bromide in it. The ethidium intercalates in the DNA and causes some rotation of the helix that changes the overall shape. Perhaps it is better when you are comparing molecules of different forms, to not add ethidium until after the gel has finished running. In the schematic diagram above, the DNA molecules migrated from top to bottom in the electric field. In practice, molecules can be visualized on a gel after staining with ethidium bromide or SYBR green I, and viewing the fluorescence pattern under an ultraviolet light. Sometimes the supercoiled, nicked circle, and linear molecules are called "form I", "form II", and "form III" DNA, respectively. If you were to raise the temperature of form II DNA solution (with a single nick in the DNA molecule) until it was boiling and the strands denatured, what would you find when the DNA was cooled?